Amazon.com has an amazing Lightning Deal today on KONG dog toys. These are one of the only dog toys that our dog can’t destroy in under ten minutes. Amazon’s “Lightning Deal” going on right now and has a few hours to go. 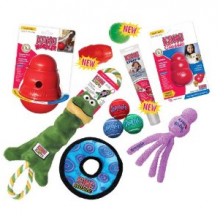 Get a KONG combo pack starting at only $29.99 this is regularly priced at $79.99.